New Delhi, March 19: National team skipper Virat Kohli, senior batsman Rohit Sharma and fast bowler Jasprit Bumrah have been included in the top most category of the Board of Control for in India's (BCCI) list of central contracts. Introduced for the first time last year, Kohli, Sharma, Bumrah, Shikhar Dhawan, and Bhuvneshwar Kumar have made it to the 'A+' category in 2018. Kumar and Dhawan have now been demoted from the top bracket to the 'A' category. 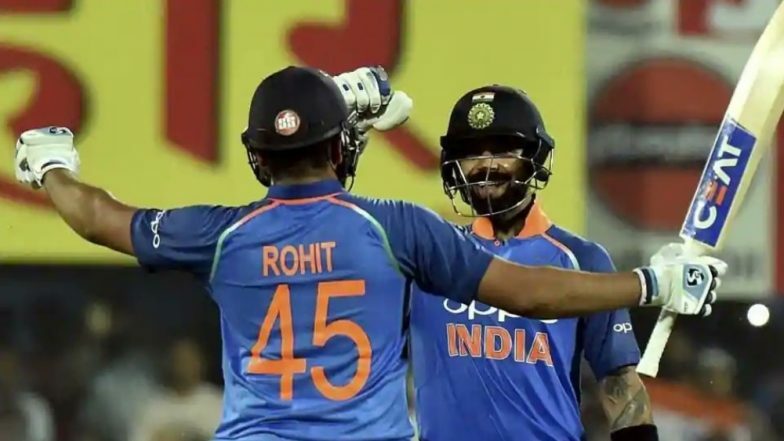 Ravichandran Ashwin, Ravindra Jadeja, Cheteshwar Pujara, Ajinkya Rahane, Mahendra Singh Dhoni, Mohammed Shami, Ishant Sharma, Kuldeep Yadav and Rishabh Pant are the other players in the 'A' category. Virat Kohli, MS Dhoni Unveil Indian Cricket Team’s New Jersey for ICC Cricket World Cup 2019 and Australia ODI Series. The 'B' category includes Lokesh Rahul, Umesh Yadav, Yuzvendra Chahal and Hardik Pandya. Kedar Jadhav, Dinesh Karthik, Ambati Rayudu, Manish Pandey, Hanuma Vihari, Khaleel Ahmed and Wriddhiman Saha are in the 'C' category.